anyone ever had a tee they design end up turning into a tattoo? i’ve had a few, always blows my mind the level of commitment some people have. i generally have a hard time putting a sticker on my car. wow dude, yeah i’d be super honored that anybody got anything i designed as a tat. Tattoos are so last summer..
scarification; cut with a scaple. good luck getting that removed. and WHY WOULD you want that removed!? plus, there’s no way to remove it haha. I’ll look for those pictures! 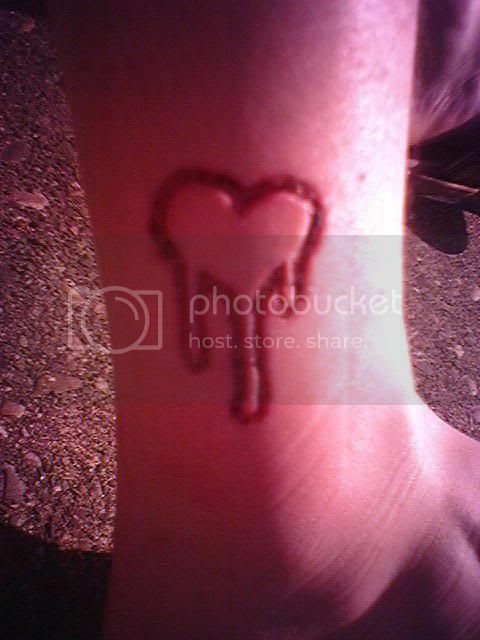 My reason for getting that as a scarification is a veryvery long and AWESOME story. The logos for Heartcore (jimmyheartcore’s company) Clothing. Jimmy has much such a significate impact on my life, and the direction I’m heading into. I can honestly say I would have the opprotunities, experiences, and friend that I have now if I didn’t have heartcore. So I wanted something more then just a small, simple tattoo, because he’s gave me more then a small simple direction in life. So to some, it might be stupid, but to me it seemed to fit perfect. I guess it was kinda my fault you had to drop off warped, wasn’t it?